The Geely MPV Concept, which was revealed at Auto Shanghai 2017, is said to preview a successor to the Emgrand EV8. The initial photos released by the Chinese carmaker certainly looked promising, with a sleek, futuristic design that includes a few touches that may be a little too far out there to make it on the production version. Here, we bring you live photos of the MPV Concept for you to better evaluate its looks. Highlights here include a modern take on the Geely grille that is flanked by a pair of sweptback LED headlights. From the side, the concept’s pillarless entry is clearly shown when the doors are opened, the rear ones being rear-hinged items. Notable cues include the dimple-like pattern near the D-pillar, also seen near the headlights, as well as a floating roof look. A character line extends from just below the side cameras to the taillights, where the narrow light bars overlap a central chrome trim that contains the Geely typeface. Inside, there are three rows of bucket seats that designed to match the exterior theme. A dash-mounted touchscreen looks to control all the car’s functions, and there’s plenty of aluminium trim on show as well. The design of the MPV Concept is the work of Peter Horbury, senior vice president for design at Geely Automobile Holdings, who had previously worked for Volvo as its vice president for design as well. Ya. Best selling at Arabia soon! This one looks better than Wira. But is the aircond colder than Wira? Proton ok? How’s exora replacement going, oops, kesian, first need to beg govt for funds to develop that right? Or you could just surrender yourself to Geely, can rebadge this beauty, with fuel efficient Drive-E powertrain, guaranteed laku keras. Proton please rebadge it as new Exora price RM50K. China is developing Tanjung malim. Why need to concept here, tease there. Just start selling whatever they built alredi! These peking ducks have a lot to learn from my fabulous P2. FYI, Peking ducks are very expensive & Geely happen 2 have loads of CASH which P1 are drooling over. Please close your mouth bcos we all can see U foaming in your mouth already. 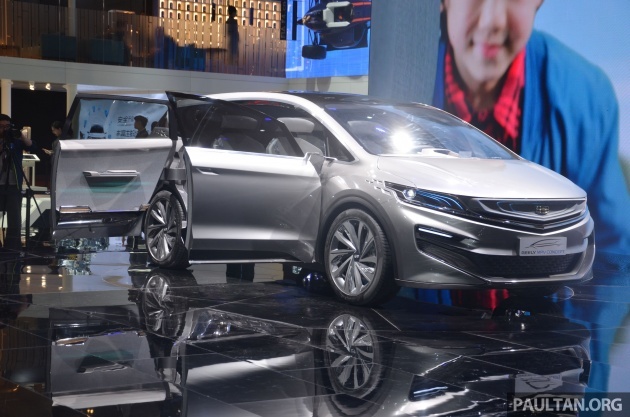 JV with Geely, Who knows maybe next Exora replacement…. It’s not JV they need. It’s a complete takeover. Beautiful and elegant MPV. Well done designers. Look Proton, if only you were humble enough, Malaysians would be able to have a Proton MPV like the above. Unlikely. XC90 is serving well as their 7-seater product. Obviously you compare between concept and end prod. Not that original. I can sense some Peugeot in the design. Yg mana kaki kondem kt sini ni mesti pakai keta mewah, conti ke.. kan? Kaya2 kan? Hehe.. ke pakai proton jgk?